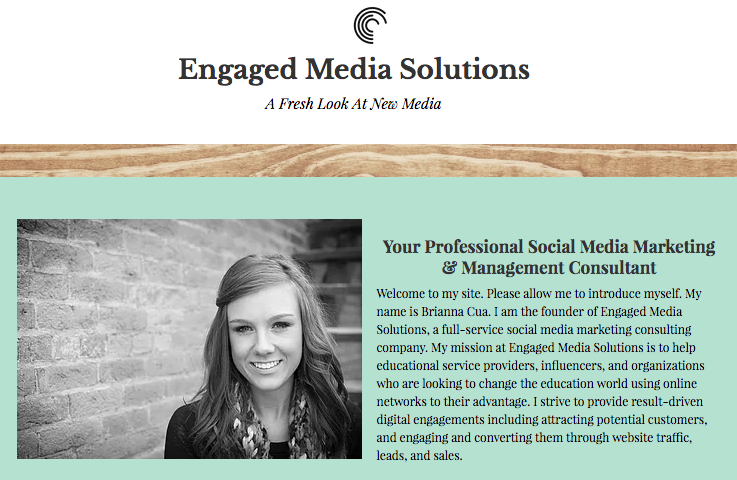 Brianna's Company, Engaged Media Solutions, Is Off To An Amazing Start! I just have to take a few minutes to share the wonderful work my daughter Brianna is doing with her new business Engaged Media Solutions. Brianna started her business back in February while she was still in college finishing her marketing degree. I couldn't be more proud of her. From the start, she worked with me and The Library Voice. 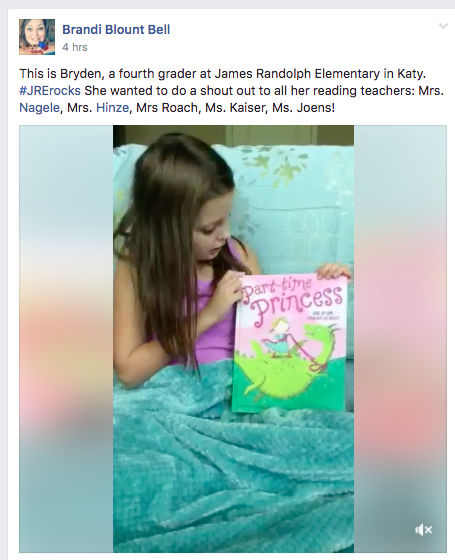 From creating content to digital stories, researching and working on social media campaigns, and creating presentations using Buncee, Brianna has been amazing! She impresses me everyday. And makes me very proud too. 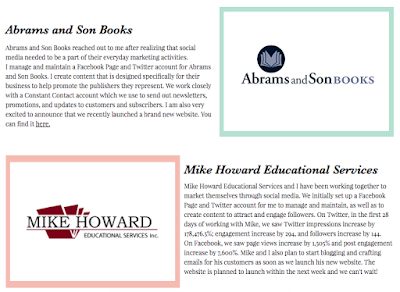 Abrams and Son Books, Mike Howard Educational Services and a few more. You can find all of this information and these businesses here. You can check out all of her clients here from her site. 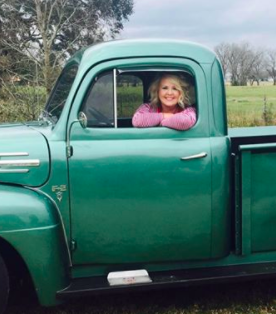 Take a look at a few and learn how she can help you. I know she would love to hear from you too. I Am A Super Cool Sticker in Buncee...and Hagan Is Too! 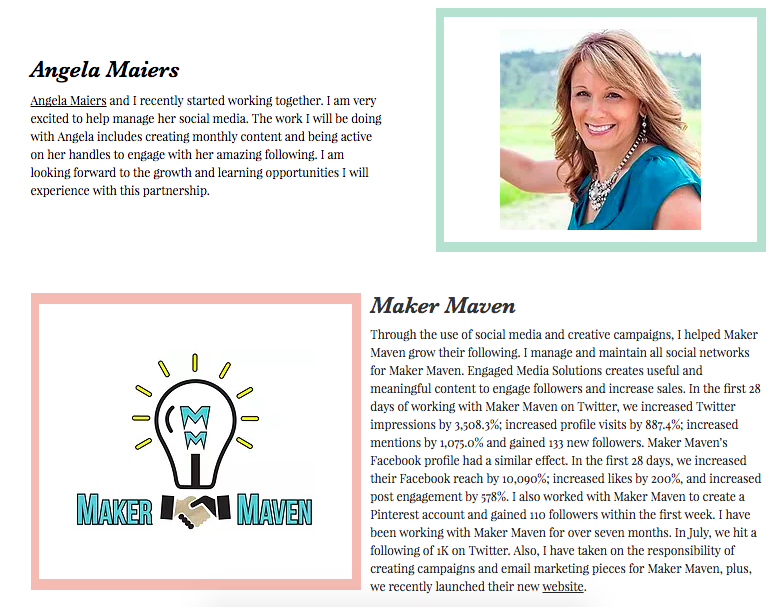 I love being part of the Buncee family. Every day something special comes up and today was definitely one of those days. From creating, collaborating, brainstorming and then this....my very own Buncee sticker that Meagan created for me. 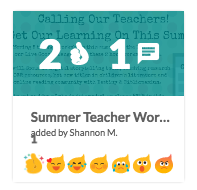 They already have created several Shannon Buncee Stickers, including a super cool Animation with me waving. In fact, they even created Hagan doing the dab, which we included in this Buncee too. It couldn't be a better Buncee day! Thank you friends. Love you all. Dozens of authors, illustrators, editors and agents have come together with author Kate Messner to create KidLit Cares an online talent auction to benefit the Red Cross relief effort for Hurricane Harvey and related flooding. details surrounding this amazing benefit efforts from so many. 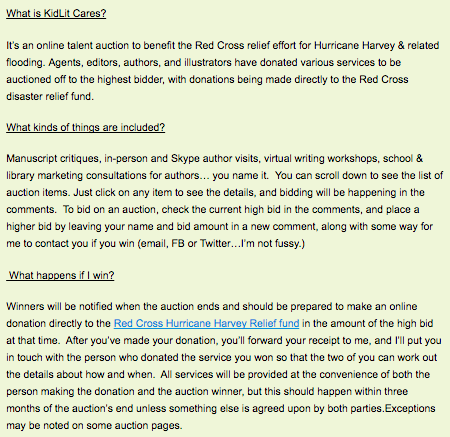 a list of the auction items too. We are lucky to be part of this caring and loving group. 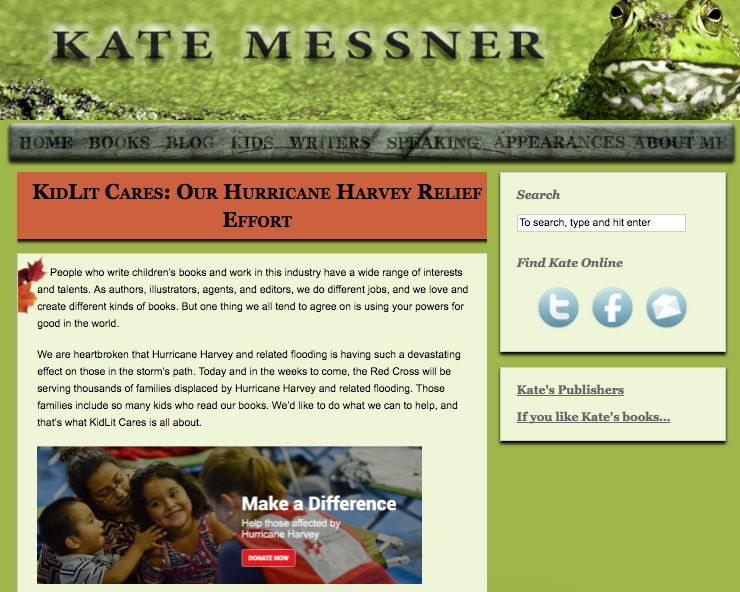 Thank you Kate and all of you who are part of the KidLit Cares project. September Library, Learning and Literacy Celebrations! 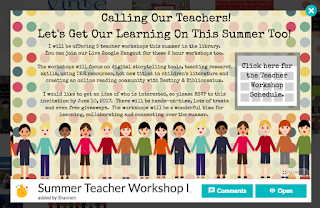 It's September tomorrow, so let's kick off the month by taking a look at all of the awesome library celebrations and reading and learning events taking place this month on the collaborative Google Doc here. And don't forget, you will also find a Pinterest Board for each month too. You can find Septembers Pinterest here. Please join on and help collect these events for September and all throughout the year. 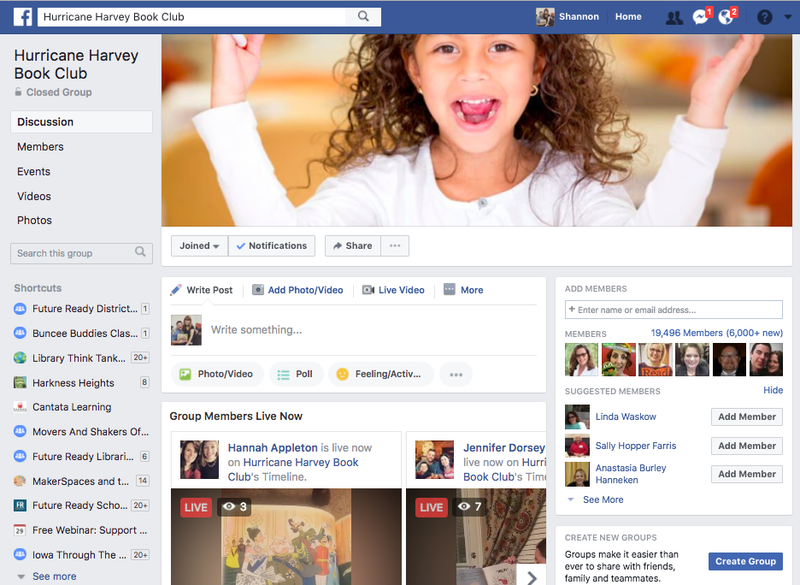 We would love to have you collaborate and collect with us. 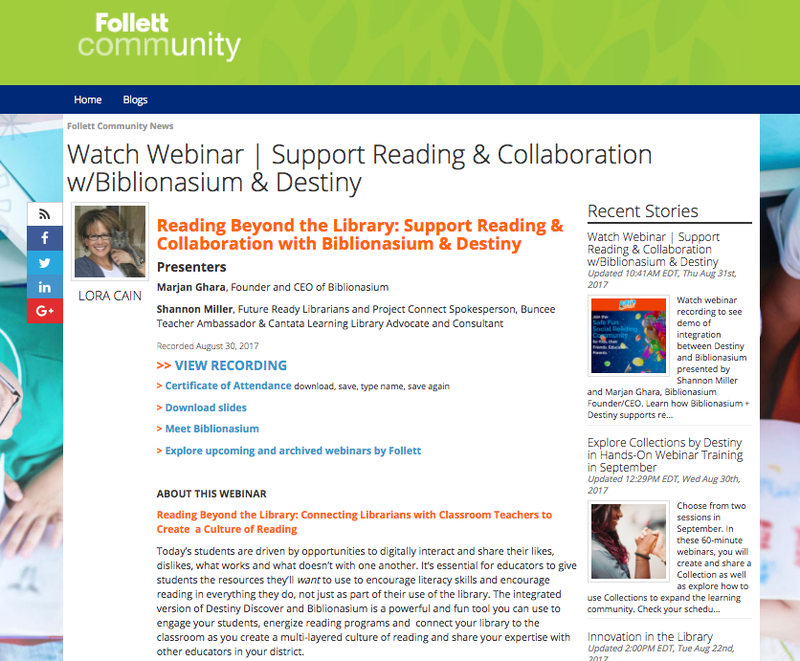 Here's The Recording For "Support Reading and Collaboration With Biblionasium and Destiny"
Yesterday I had the honor of presenting Reading Beyond the Library...Support Reading and Collaboration With Biblionasium and Destiny with my friend Marjan Ghara in a webinar sponsored by Follett. 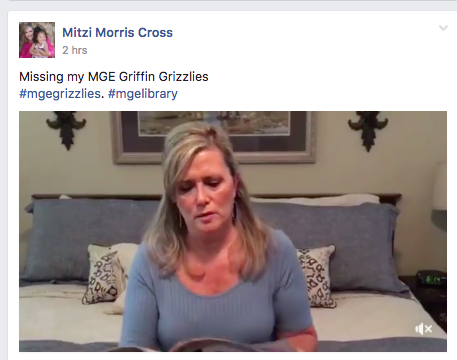 If you missed this presentation or want to watch it again and see the resources we shared, you will find it online at the Follett Community here. Lora also included the Certificate of Participation, the presentation slides and a link to Biblionasium. 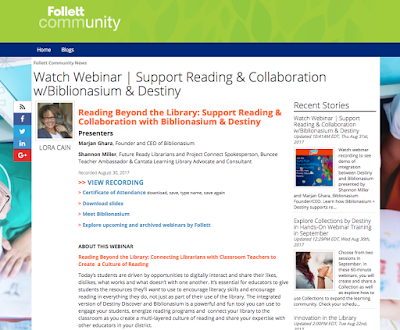 I also wanted to share the Follett case study I referred to several times in our presentation. 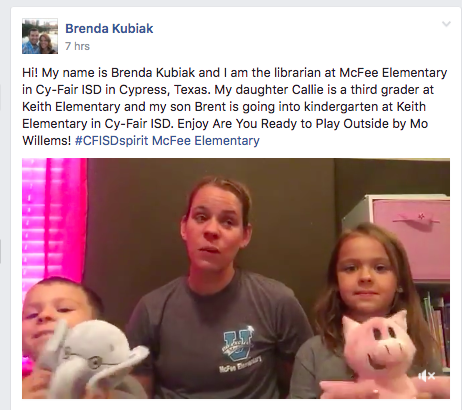 You will find this wonderful case study with K-12 teacher librarian Jennifer Underhill here. 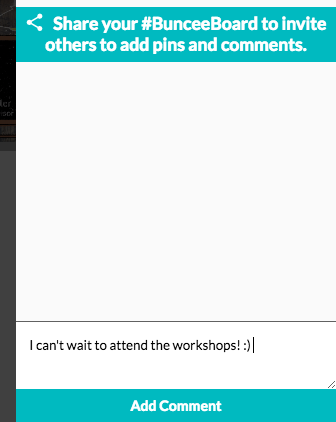 As you can see from this tweet and my post, yesterdays webinar was awesome! 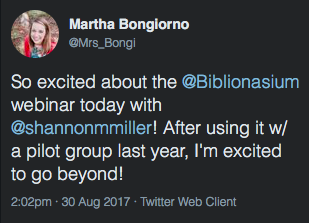 As you kick off another school year, I can't wait to hear how you are using Biblionasium and Destiny within your library, classroom and school community too. 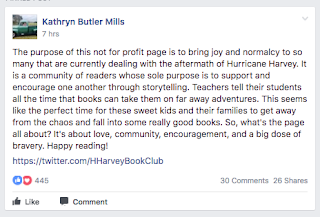 This week as we all watched and prayed for everyone in Texas during Hurricane Harvey, a 2nd grade teacher from Katy, Texas did something very special to support the children and families being affected by the terrible devastation taking place. 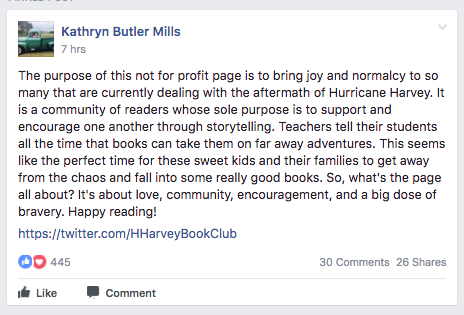 Kathryn Butler Mills started the Hurricane Harvey Book Club. 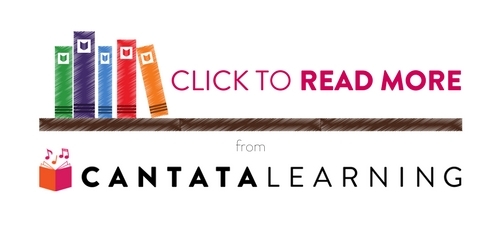 It is a community of readers whose sole purpose is to support and encourage on another through storytelling. Teachers tell their students all the time that books can take them on far away adventures. This seems like the perfect time for these sweet kids and their families to get away from the chaos and fall into some really good books. This page is about love, community, encouragement and big dose of bravery. Happy Reading. 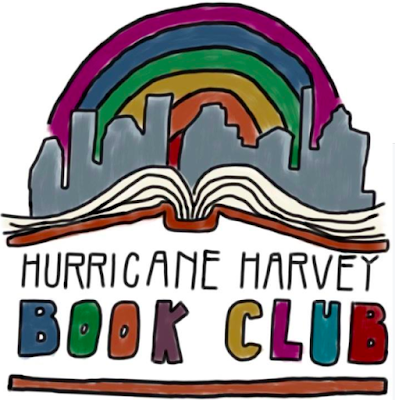 Since Kathryn started the Hurricane Harvey Book Club, it has grown to over 20,000 people connecting, reading, sharing and coming together to share books, reading and love. It is just amazing to see what is happening here and the community that has come together. Thank you Kathryn. You have made such a difference in the lives of so many and together, we will continue to make a difference for the children in Texas. Happy Reading everyone. We can't wait to see what you read. You can join the Hurricane Harvey Book Club Facebook Group here. 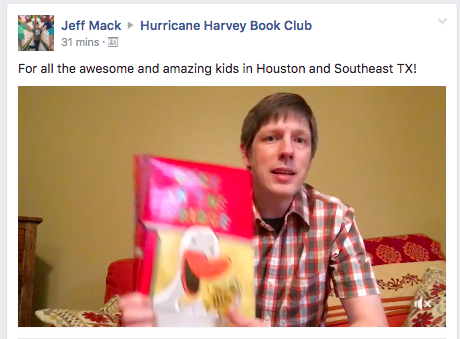 Read more about this story in the article How the Hurricane Harvey Book Club is helping little flood victims with words on Today.com too. Say Hello To Buncee Boards! Today is the day! The day Buncee is revealing that BIG surprise we have been talking about. 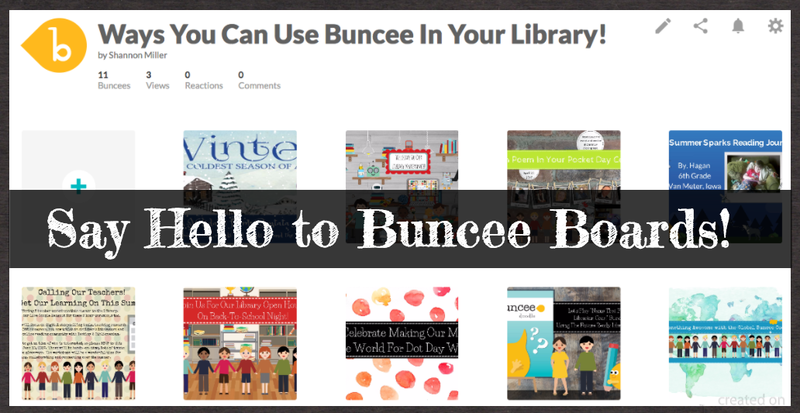 Say Hello to Buncee Boards, a place to bring together Buncee's in a very special place. They are the perfect way for your class to collect, share, comment, collaborate and reach to each other's Buncee within your library, classroom and even half way around the world. As you can see from the Buncee Board above, I brought together several ways you can use Buncee in the library. Not only can we bring Buncee's together on a Buncee Board, we can also give feedback to each Buncee in form of reactions and comments. You can see these come up when I scroll over the Buncee in the middle above. several other pop up that I can click on too. 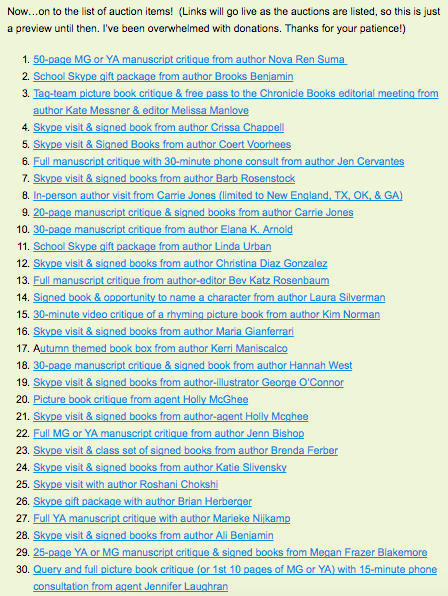 Once I click on one, it will show up in the number of responses on that Buncee. click on the thumb (reactions) or add comments. 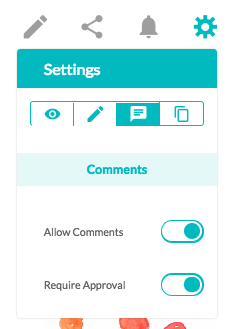 When you click on Comments, you can add them in this box. 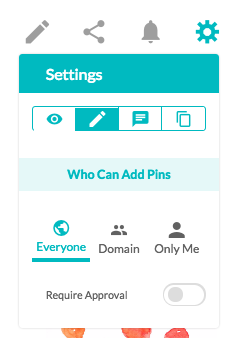 You can also Share Your #BunceeBoard to invite others to add pins and comments. I love this feature! 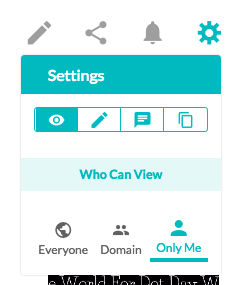 The Buncee can also be opened at the bottom of this window too. 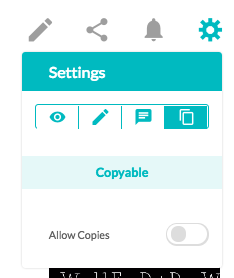 Your Buncee Board can be edited with the tools in the right hand corner. The little pencil allows you to change the title and subheading. 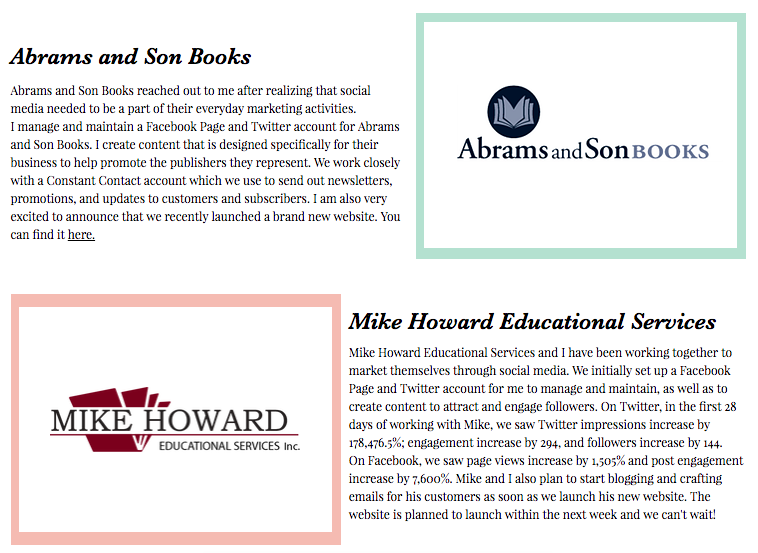 They can be shared by a link, email and through several social networks and online places. and if you want to allow copies. 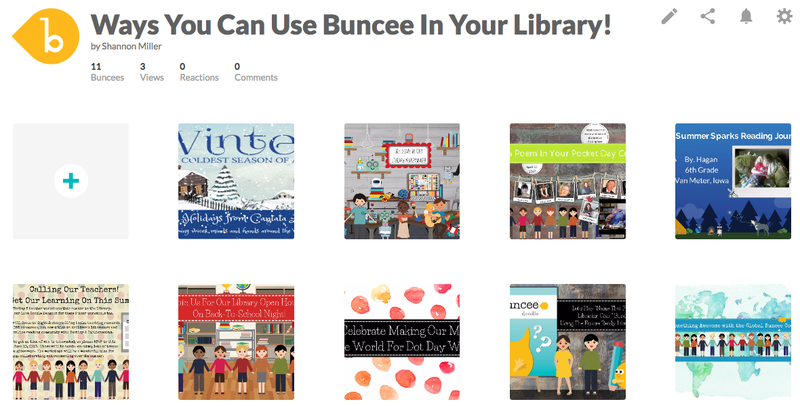 With the reveal of Buncee Boards, I know what I will be doing this week as I bring together Buncee's in a whole new way! 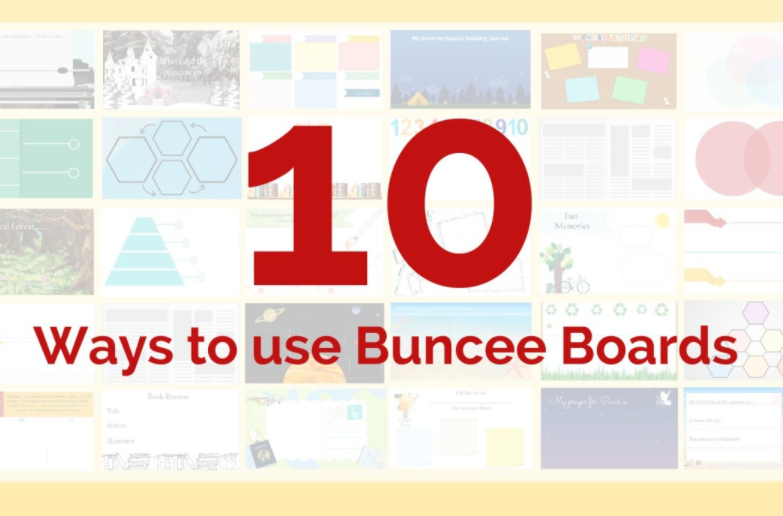 On the Buncee blog, you will also find an amazing post, 10 Ways To Use Buncee Boards, to give you ideas and inspiration. How are you going to use Buncee Board? 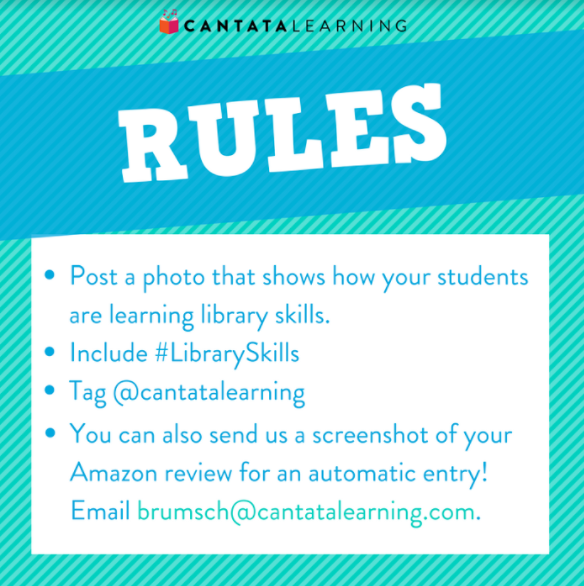 Show Off Your Students #LibrarySkills & Win New Books & BINGO From Cantata Learning! 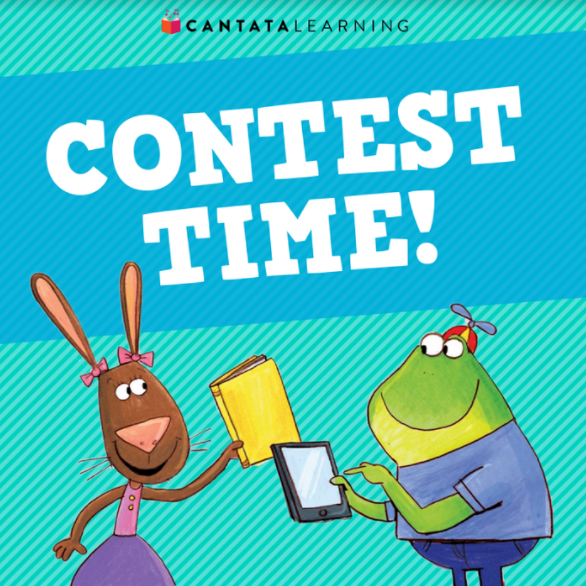 We're running a contest in celebration of my Cantata Learning Library Skills series -- woohoo! 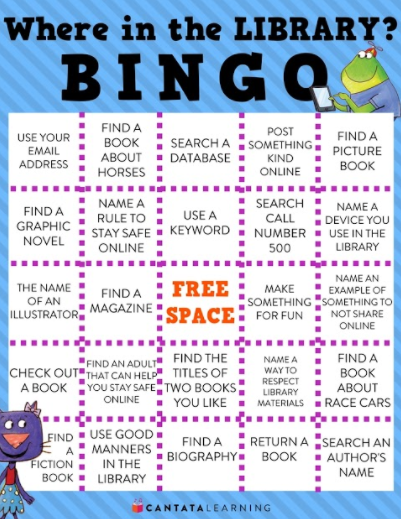 You can participate for a chance to win prizes like books and even this sweet little Library Skills BINGO game that will be perfect to use with your students in the library this year. 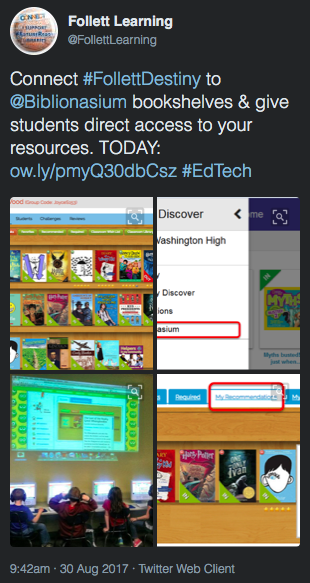 Post a photo that shows how your students are learning and using their library skills. You can also write an Amazon review for any of the four books and you will be automatically entered into the contest! 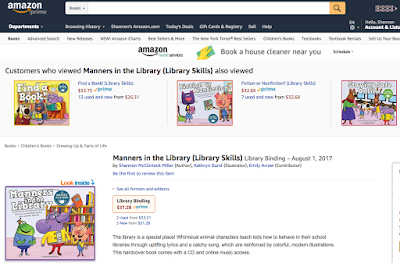 You will find the Library Skills series on Amazon here. Just send us a screenshot of your Amazon review in an email to brumsch@cantatalearning.com. We'll announce TWO WINNERS each month! 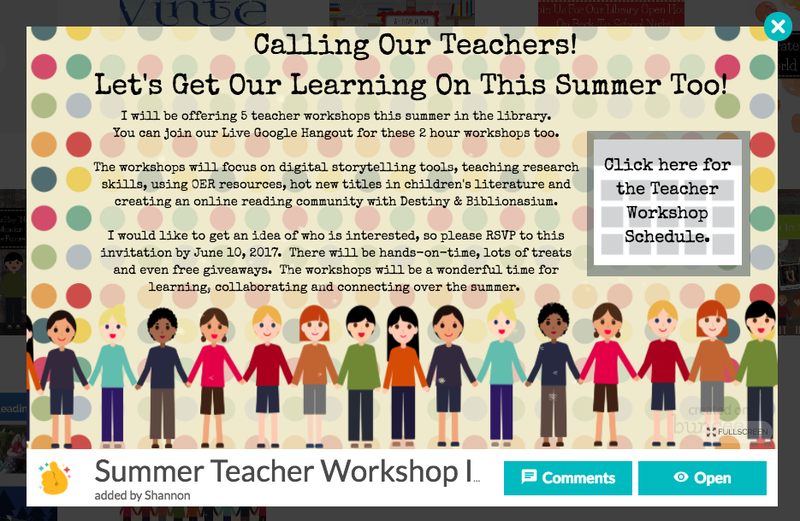 I can't wait to see all of the awesome ways you teach #LibrarySkills in your library. Big News....We Can Now Hide Public Collections By Destiny! This afternoon we received some awesome news from Jason See at Follett! 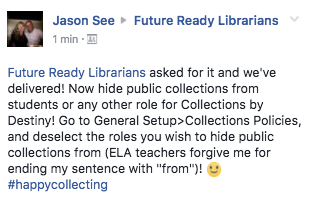 Jason shared that we can now hide Public Collections from students or any other role for Collections by Destiny! All you have to do is go to General Setup. 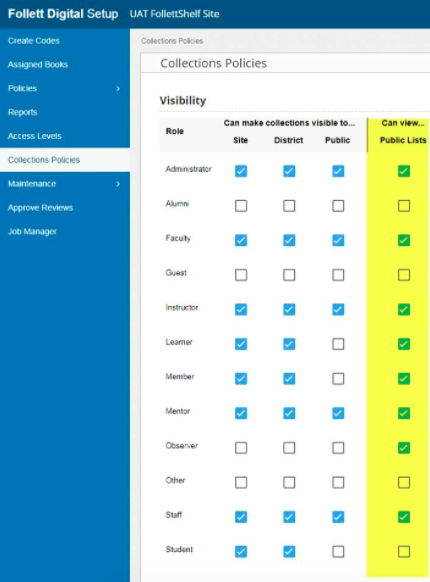 Then click on Collections Policies and deselect the roles you wish to hide Public Collections from, which can be seen in the yellow column above. This new feature is going to come in very handy and be important as we kick off the new school year using Collections with your students, teachers and learning community too. Thank you for this news Jason! To read all about Collections by Destiny, please see this post. 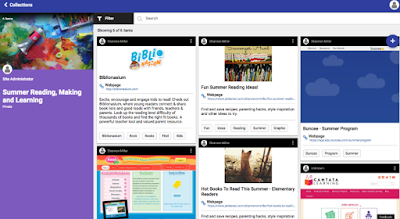 3 Back to School Activities From Storyboard That!